Kangaroos are one of the most emblematic animals of the fauna of the Australian continent; however the modern species are only remnants' of a much larger group. 50.000 years ago humans arrived on the continent; 45.000 years ago nearly 90% of the larger species of kangaroos went extinct, along with other large marsupials, reptiles and birds. The extinction of the Pleistocene Megafauna has inspired many hypotheses, and at least for Australia and the pacific islands the contribution of humans seemed highly probable. Humans could effect large mammals, with low population densities and slow reproduction, direct by hunting them, or indirect by modifying or destroying their habitat - a combination of hunting and use of bush fires to clear the landscape by humans seemed the most convincing cause for the extinction event in Australia. 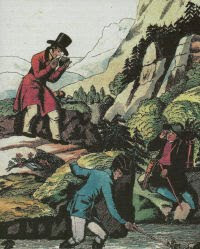 To verify this hypothesis two approaches are necessary, establishing an exact chronology of the extinction, the arrival and dispersal of humans on the continent, and understand the interrelationships between animals and humans - did humans hunt actively and effectively the disappeared species, and did they target and destroy specific habitats? Fig.1. Thylacoleo sp. hunting the Goliath-kangaroo Procoptodon goliah in Australia some 50.000 years ago, raffiguration by the Spanish paleo artist Mauricio Anton (2004). 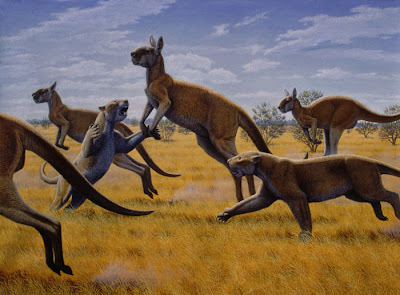 A study of the anatomy of the biggest kangaroo species known, Procoptodon goliah, revealed that in contrast to old theories is was rather a browser then a grazer, feeding probably on plants of the Chenopodiaceae - family, and surviving in the arid environment of the steppe. This observation seems to rule out the effect of climatic changes during the last glacial maximum, resulting in a dry continent, to the demise of the species - Procoptodon adapted and evolved to handle the new climate. The scrubland steppe, with inhomogeneous distributed "fuel", is also a landscape where fires and landscape burning would be less effective, it seems reasonable to argue that it was not the primary target for human hunters or colonizers. These two observations seem to support the last factor, active hunt, as one of the major causes contributing to the extinction of the Pleistocene fauna. However such an affirmation is problematic, it is very hard to confirm such a claim based not on direct evidence, but by elimination of other possibilities - ruling out factor A or B doesn´t automatically verify factor C.
Archaeological site with occurrence of both species of the megafauna and humans are rare, and in part highly controversial. Most archaeological sites of the first occupation of Sahul and the period of faunal change are lost today, covered by the rising sea after the last glacial maximum. This makes is very difficult to quantify if, and how long humans and extinct species lived together. Archaeological evidence for active hunting of large species is also missing. The controversy is far to be over, but the preliminary study of the ecology of Procoptodon shows how detail research on the single species, rather then a general fauna, can give more concrete clues to establish the causes of an ecosystem demise.